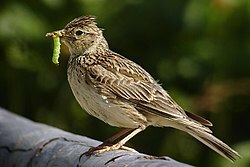 Larks are passerine birds of the family Alaudidae. All species occur in the Old World, and in northern and eastern Australia. Only one, the Shore lark, has spread to North America, where it is called the Horned lark. Habitats vary widely, but many species live in dry regions. This page was last changed on 25 February 2016, at 13:57.